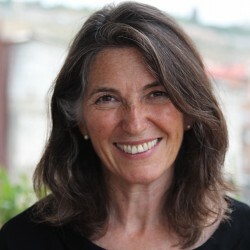 Our guest today is author, artist, and anthropologist Dana Walrath, whose first Young Adult novel, Like Water on Stone, was released in November. Like Water on Stone is Dana’s beautiful rendering of a horrific story—her grandmother’s fleeing of the 1915 Armenian Genocide when she was only a girl. Told in verse, this lyrical and moving story has won starred reviews from both Publisher’s Weekly and The School Library Journal, not to mention accolades from some of children’s literature’s heavyweights. Newbery Medal Winner Karen Hesse says of it, “A heartbreaking tale of familial love, blind trust, and the crushing of innocence. A fine and haunting work.” And Newbery Honour Winner Rita Williams-Garcia writes, “Like Water on Stone is as wrenching as it is evocative and hopeful.” So, you see, Dana has received high praise for her debut novel! Dana is also an artist and anthropologist, who has used stories and art to teach medical students at the University of Vermont’s College of Medicine. Joining together her talents, she produced a graphic memoir, Aliceheimer’s, which chronicles her experience of caring for her ageing mother. You can also discover Dana’s insights from this experience in her recent Ted Talk—Comics, Medicine and Memory. But what of Dana? How has she been filling her time in the wake of Like Water on Stone’s release? Here she is to share What Was on Dana Walrath’s . . .
Travel Itinerary: Thanks so much for having me here, Sandra! During this centenary year of commemoration for the Armenian genocide, my days have been filled with speaking and political action as well as writing. Yesterday for example, the Vermont legislature unanimously passed a genocide centennial resolution and it was an honor to be a part of this. At noontime, legislators joined me and my fellow Vermont Armenian warrior, Chris Bohjalian, as we spoke about why the Armenian genocide matters today and what drove us as we write our respective stories about the genocide. Fellow Vermont Armenians made a beautiful spread of desserts and savouries to entice the legislators. One legislator confessed stopping in for a snack but being so moved that she stayed. Tomorrow Chris and I will be on Vermont Public Radio’s program Vermont Edition. Earlier in the month I spoke about Like Water on Stone in NYC at the Responsibility 2015 conference and at events in San Francisco and LA. I also did my first school visit at Ferrahian High School. It was so gratifying to have 10th and 11th graders in California say that from my book they could imagine what life was like in historic Armenia before the genocide. This was so important to me, and something that Julie Larios guided me toward at VCFA the semester I worked with her. Recent travel also included a sweet trip down to VCFA to speak at the annual Novel Writing Retreat. During this busy time, I have been determined to stay connected to creative writing making the weekend energizing for me as well! Drawing Board: There aren’t enough hours in a day! But I have managed to sneak into my studio some. I am working on a series of drawings to get embedded into my novel about hoarding disorder. It took me a while but I found the visual voice and it in turn has led to a new plot thread within the book. I’ve also made a few pieces to go along with talks I have given. Here’s one that connects my graphic memoir, Aliceheimer’s to Like Water on Stone. Kitchen Table: The kitchen is the center of life in an Armenian home! It connects us through generations and is one of the pieces that persists after genocide. My favorite kitchen moment since Like Water on Stone came out took place on Christmas day. All three of my sons and my new daughter-in-law were over. We made lahmajoon (Armenian pizza) and some other Armenian foods that appear in Like Water on Stone, packed them up and brought them to Alice at her new home for Christmas dinner. It was the best present we could have given her as it felt like her childhood home. 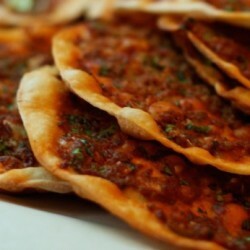 Thank you to Ararat magazine for this photo of Lahmajoun. The link will take you to their recipe. I used the one I had from my mother. Stereo: My oldest son once asked me if music was our religion and I suppose it is. The spirit of music is integral to Like Water on Stone where Papa, a musician, counts a Kaban, Kurd and Mustafa, a Turk, fellow musicians among his closest friends. Music transcends boundaries. In daily life my husband Peter writes fantastic songs and sometimes I sing harmony with him, as we did in the Mad Batter restaurant in Cape May, NJ. 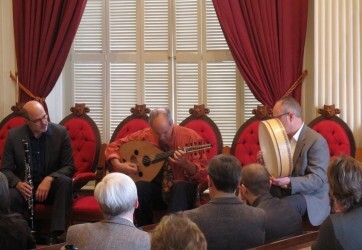 Yesterday his band Lokum played Armenian music at the Statehouse for the devotional that preceded the reading of the genocide resolution and received a standing ovation! Calendar: April will be amazing. I head back to Armenia this weekend. For the past year, students at Armenia’s TUMO Center for Creative Technologies have been working on creating an animation of Like Water on Stone that will be premiering on April 21st. I will be reading from and speaking about Like Water on Stone at the American University of Armenia as well as being part of their program to commemorate the genocide. 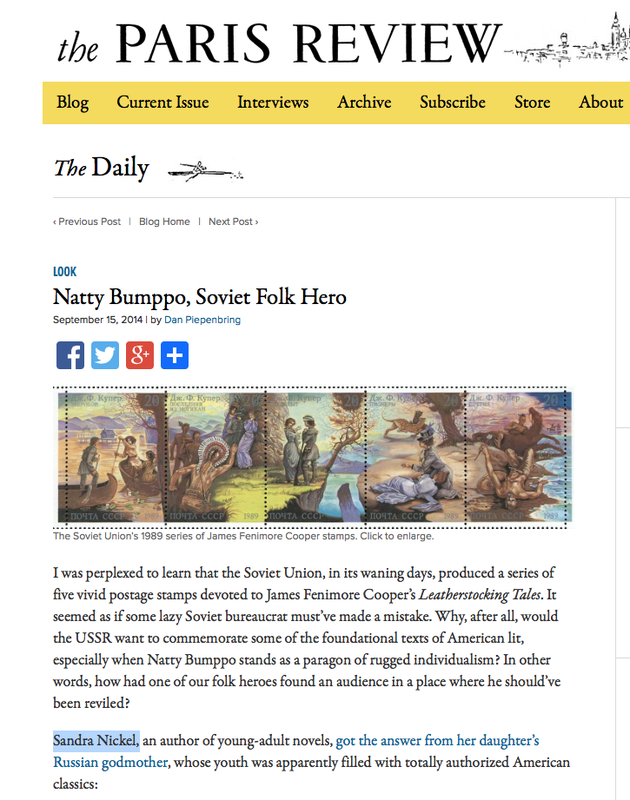 As soon as I land, I will be working with students at TUMO and also staying connected to the US as the guest writer on Figment to honor National Poetry Month. In Yerevan, I will also be a part of the Literary Ark Festival which brings together writers readers and literary experts from throughout the world together to exchange ideas and to share their work with Armenian writers. Meg Rosoff will be representing the UK, and I am representing the United States. From Yerevan, I go to Beijing to speak about Aliceheimer’s at the Beijing American Center and at Beijing Medical University. I am so delighted to be bringing the field of graphic medicine to China through these talks and my TEDx talk “Comics, Medicine and Memory.” I will also have an exhibit of some of my Aliceheimer’s art while there. While in Beijing I will also be presenting Like Water on Stone at Beijing’s English Language bookstore The Beijing Bookworm. From Beijing I go straight to Washington DC to participate in the National Commemoration of the Armenian Genocide. By the time I get back to Vermont in the second half of May, flowers will be blooming at last. List of favourite experiences from Yerevan: I am blessed to be able to be in Yerevan on April 24th the day that the genocide is officially commemorated. I lived there as a Fulbright scholar in 2012-2013 and worked on a project that builds on my Aliceheimer’s work. Random House acquired Like Water on Stone during that first fall so my Fulbright year also included the last set of revisions. Whenever I needed to go to the Armenian Genocide Museum and Institute, perched high on a hill on the far side of a gorge in the city of Yerevan, to complete any additional bits of research, I had an instinct to walk there. On April 24th I knew what had drawn me there. 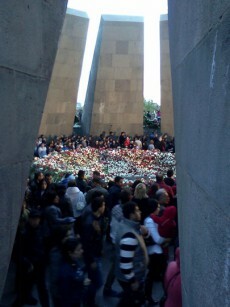 Each April 24th tens of thousands of Armenians walk to the memorial outside the museum to lay flowers around the flame at its center. My Fulbright project, “The Narrative Anthropology of Aging in Armenia” built upon Aliceheimer’s. My fieldwork involved spending time with elders there. They became the grandparents that I never knew. I met with them in soup kitchens, active senior groups, political rallies, their homes, and my neighborhood church. They passed down medicinal remedies and shared the stories of their lives with me. My academic homes while there were the School of Public Health of the American University of Armenia and the Institute of the Archaeology and Ethnography of the National Academy of Science of Armenia. Fortuitously, one of my dear anthropology colleagues in Yerevan, Dr. Levon Abrahamian, is a wonderful cartoonist. He introduced me to the cartoonists and comics folks in Yerevan. 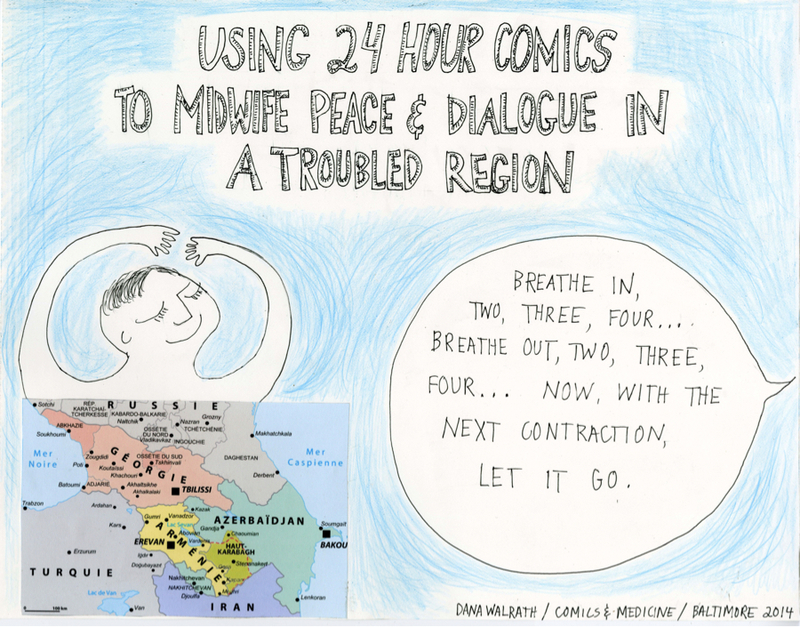 I was delighted to help them create a border-crossing comics project to promote peace and dialogue in the region. During my last month in Yerevan we held a 24 hour comics marathon with participants from Armenia, Turkey, Georgia and Azerbaijan. The tradition has continued with other marathons and friendships across closed borders. Desk: As you can imagine, my desk often has several projects going at once in various stages of completion. This gives me the space to let things sit. When a story problem needs some time with my subconscious I can concentrate on something else. During this very busy Armenian period I’ve dug back into concentrating on a revision of Life It Gives, the story of Armenian immigrants in New York City in the 1930s, the descendants of the young ones from Like Water on Stone. Even during periods of intense travel, writing keeps me grounded. I make sure to touch base with some bit of creative work each day even if it is only for five minutes. Mind: Since my mother’s dementia has become the primary force in her life, she is always on my mind. It hasn’t all been bad! She lived with us for the first few years of this journey. Early on she gave me two huge gifts: First she made me promise that when it got too hard that we would do something else. Second she said to me, “You should quit your job and make art full time.” I listened and haven’t looked back. After Alice left our home, she lived in memory care near my brother and sister. But two months before Like Water On Stone was to be released, she was kicked out. I was given 30 days notice to find her a nursing home. Instead, I have brought her back to an amazing community in Vermont called Living Well where she is loved and understood as a person. My mind can rest now that she is so well cared for especially as I am about to embark on these travels. This new layer of the dementia journey will be a part of the sequel to Aliceheimer’s that I am working on tentatively titled Between Alice and the Eagle. This book will integrate my experience working with elders in Armenia as a Fulbright Scholar with my mother’s dementia story. Tags: Alzheimer's, Armenia, books, Dana Walrath, Like Water on Stone, Sandra Nickel, The Writer's Life, What Was on Her, What Was on My, Writing. Bookmark the permalink. 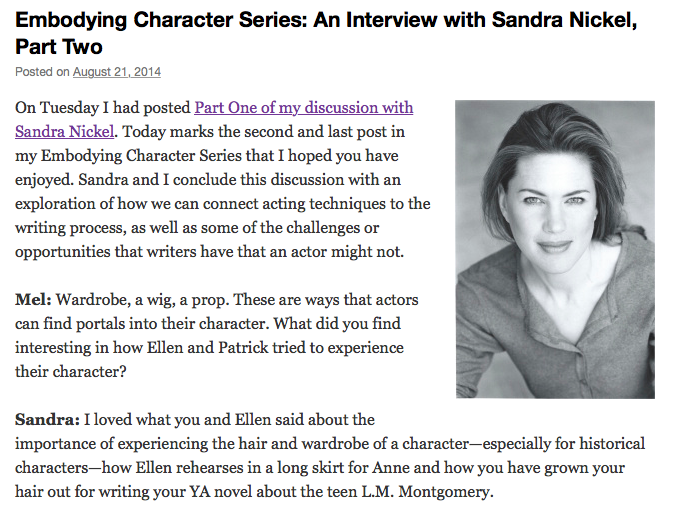 Previous post ← Stacy Nyikos–What Was on Her . . . I love reading about what’s going on in your life, Dana! And have a wonderful trip! I’m glad you were able to find a good place for your mother as well. I’m really late to the party. Dana is amazing!!! Oh Dana! Your ability to juggle so many different creative projects is truly astonishing and inspirational. Everything is coming up roses. I’m so proud of you.